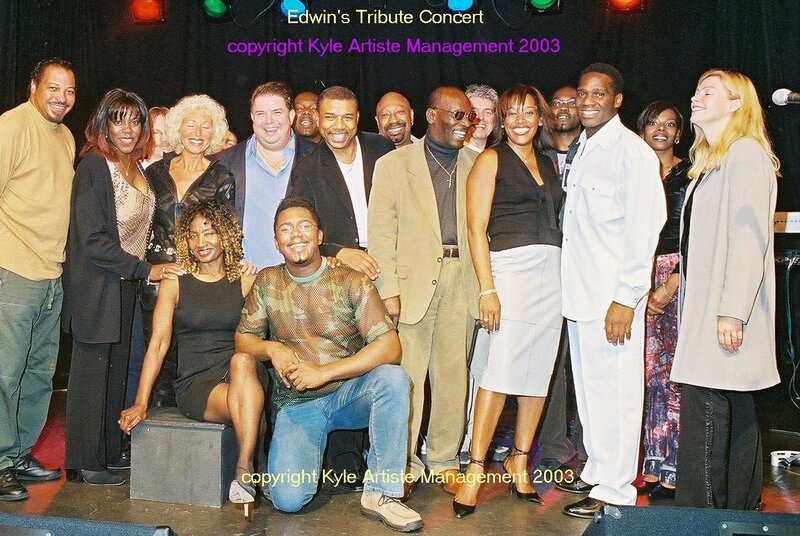 A historic event by any standards, the Tribute Concertwas an amazing experience for all and Kyle Artiste pay a heartfelt thanks to the artistes and audience who attended and especially Barry Collings. 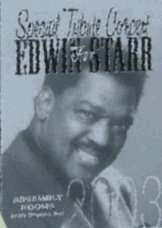 Edwin's Tribute Concert took place on Sept 28th 2003 at The Assembly Rooms, Tamworth, near to Polesworth where Edwin made his home for many years. 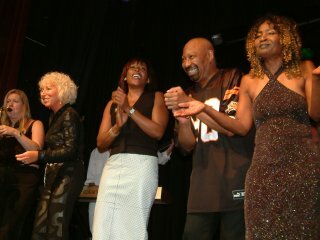 There were two performances, 4pm and 8pm and both were sold out. 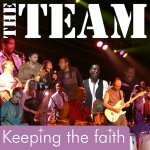 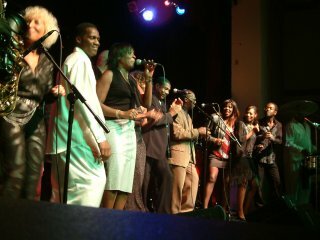 As well as Angelo and The Team, the tribute show presented Gwen Dickey, Jaki Graham, Viola Wills, Clem Curtis of the Foundations, The Real Thing, Heatwave, Lorraine Silver, the great Geno Washington, and surprise visitor Roy G Hemming of the Drifters. 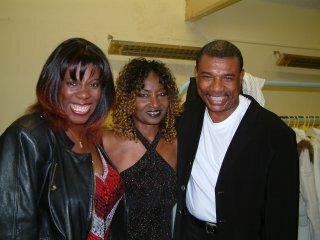 If you attended the concert, Kyle Artiste Management would love to hear from you, please enter any comments you wish to share via the guestbook. 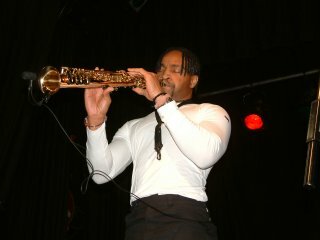 © All photos are subject to copyright. 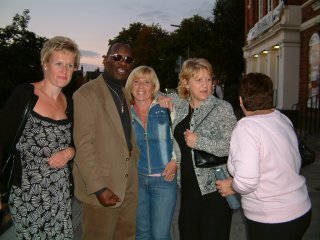 Beverly Ridout (The Team), Lorraine, Gwen, Geno and Viola. 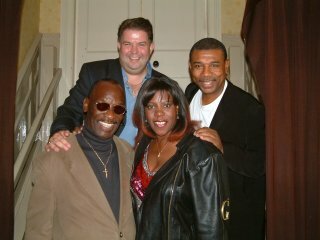 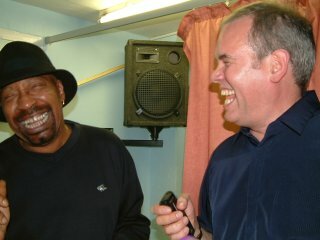 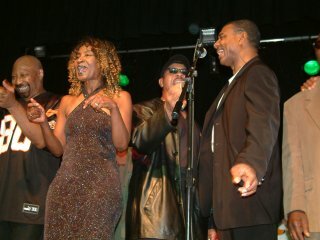 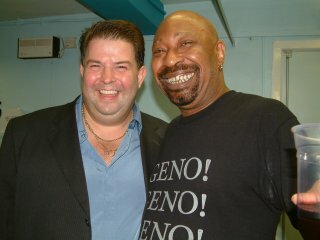 The show was compered by John Watson, here with Geno.